AS MUCH AS WE MAY ENJOY SPENDING TIME BASKING IN THE FAMILIAR BEE CAVE SUNSHINE, THE SUN IS WHAT AGES YOU. Admit it, basking in our glorious Texas sunshine is one of the best feelings in the world. But, soak it in with a grain of salt zinc. Sun damage often occurs beneath the skin without notice, only to reappear years later in the form of wrinkles and spots. DID YOU KNOW THAT 80%-90% OF AGING IS CAUSED BY SUN EXPOSURE? WHY IS THAT? 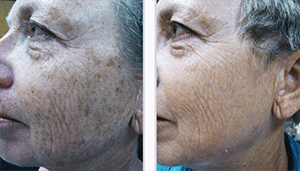 As you age, sun damage beneath your skin will start to surface. Years of unprotected sun-exposure will lead to a variety of skin problems. Unseen sun spots and wrinkles are eminent, unless you actively protect and revitalize your skin. Why look older than you actually are? Elastin and collagen are what your skin cells need to regenerate smooth, soft, and vibrant skin. Unhindered ultraviolet radiation damages your skin’s DNA, causing elastin and collagen to break down and melanin production to increase in an attempt to protect your skin from damage. This leads to the eventual formation of age spots, freckles, and uneven skin tone. 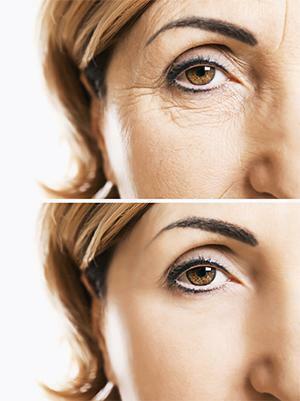 Lines and wrinkles occur when there is a deficiency of collagen and elastin, and you lose volume in your face. SOUNDS SCARY. 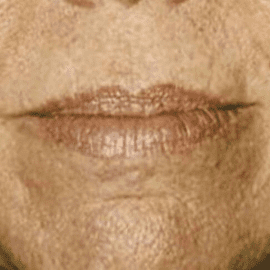 IS THERE ANYTHING I CAN DO TO REVERSE THE DAMAGE AND PREVENT AGING? The only solution is to never go outside again. Kidding!! Actually, there are numerous ways to combat sun damage and revitalize your skin without becoming a hermit. First, wear sunscreen. Most sunscreen above SPF 30 will do wonders to prevent sun damage. Just remember to use consistently. For advanced creams and age-reduction products, stop in our office. We’ve taken time to select a suite of products that work well together and are known for working as quickly as possible. Unless you’ve been wearing sunscreen every day since you were born, sunspots have been forming deep in your skin and damage has been occurring. The good news is that recent technological achievements have not only given us a better understanding of how sun damage occurs on a cellular-level, but now allows us to reverse many of the effects of years of sun exposure. Reducing age spots, wrinkles, and lines will instantly take years off your age, not to mention you’ll look and feel great. Dr. Ledbetter and his trained staff will assess your skin and tailor treatments just for you. Some of the technologies they utilize are Sciton’s Halo Hybrid Fractional Laser, BBL also known as BroadBand Light, SkinPen Microneedling by Bellus Medical, Platelet-Rich Plasma (PRP), BodyFX by InMode radio frequency, IV nutrition therapy, chemical peels, cosmetic injectables (Allergan’s Botox and Galderma’s Dysport) and collagen stimulation fillers (Allergan’s Juvederm and Galderma’s Restylane), as well as more. L-Aesthetics and Longevity MedSpa in Bee Cave, Texas, has invested in the latest and best beauty-tech around. 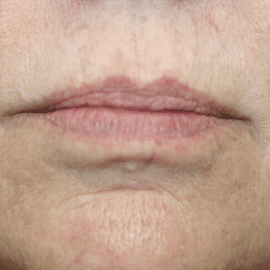 Our advanced lasers and micro-tech operations can instantly smooth wrinkles, dissipate blotchy sunspots, and stimulate collagen production for long-term youthfulness. You can explore our treatments below, but it’s best to have a professional maximize results for your unique skin. Our experts will guide you through advanced combinations of procedures. Look years younger, sometimes instantly.